Here is another set of the Ulta3 nail stickers that I tried. 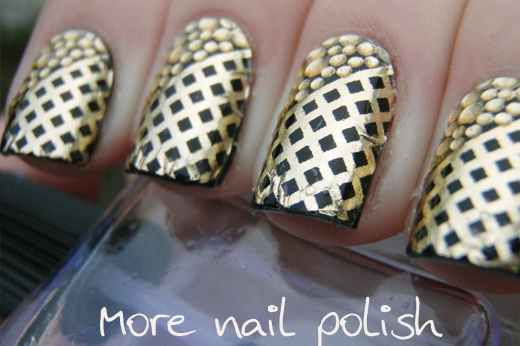 The design has a combination of raised gold droplets together with gold mesh design. The stickers themselves are translucent, so your base colour shows through the little diamond shapes and around the droplets. I chose to wear them over a black base. When I first applied these, they were lovely and smooth, but I decided to add a coat of Seche Vite to seal in the tips and help stop any lifting. Unfortunately, this caused the tips to wrinkle up a bit, and created some creases in the sides too. The following day the Seche Vite peeled off in a large sheet off every nail. It lifted off up to the textured part, where it ripped like perforated paper. The instructions don't say anything about adding a top coat to the stickers, but I thought, at the time, it was a good idea. In the future though, I wont be adding Seche Vite and I will see what the wear is like and if the tips peel. This is what the packet looks like. It comes with 16 stickers, costs $5 and I use the five largest sizes. Has anyone else tried these Ulta3 nail stickers yet? What was your experience like. Love the idea that they are see though so you can really change out the look with a variety of base shades. I don't have an ULTA for hundreds of miles so I never get there. So far I have not developed a habit of purchasing from them on line. Hopefully without the SV topper these will lay down and wear better next time. I am not a huge fan of nail apps but I really do like the idea of how these have their translucent areas. These look cool - gorgeous pattern, but the wrinkles would annoy me too much. I tried some Born Pretty stickers and they were awful, so I'm not keen on trying stickers again until I find thin ones that go on perfectly!